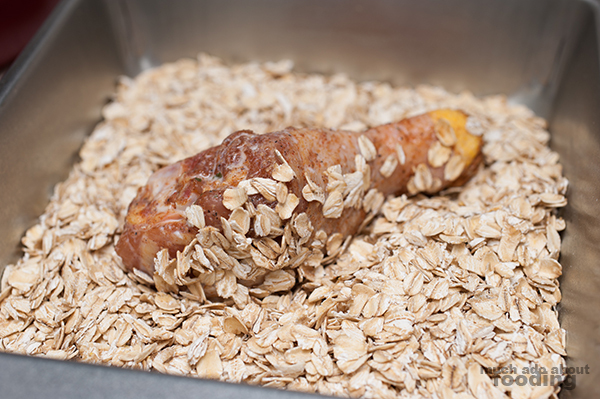 While thinking about oatmeal for the Test Kitchen ingredient, I remembered a recipe I had saved a long time ago from a fun blog I occasionally check in on. 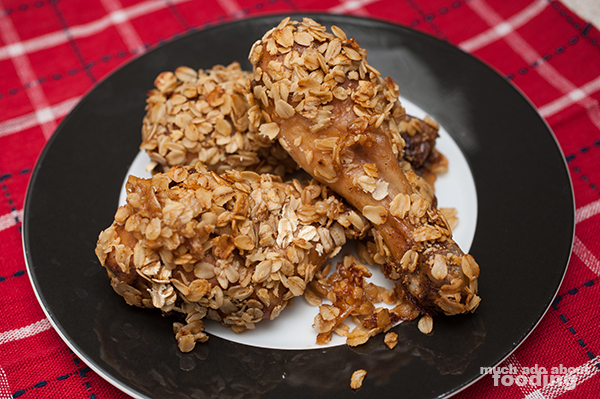 You can see the recipe here, which I adapted a tad bit to make some oatmeal fried chicken. Funnily enough, this was also a suggestion by Elgin that popped up on the Facebook fan page. Looks like I knocked out two thoughts in one go. 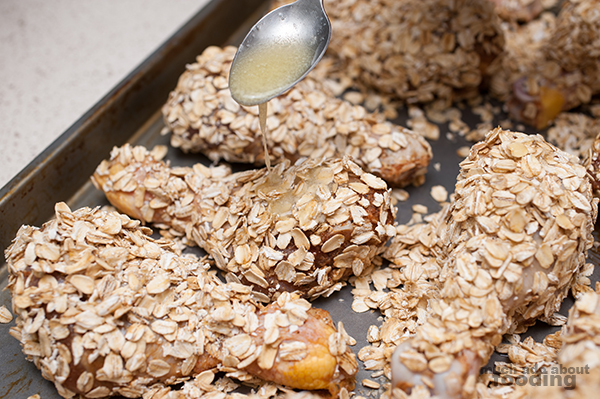 Check out the tasty recipe for this alternative to deep-frying (I used the oven) and too much batter (oatmeal was the breading). You'll need several separate containers throughout this recipe. 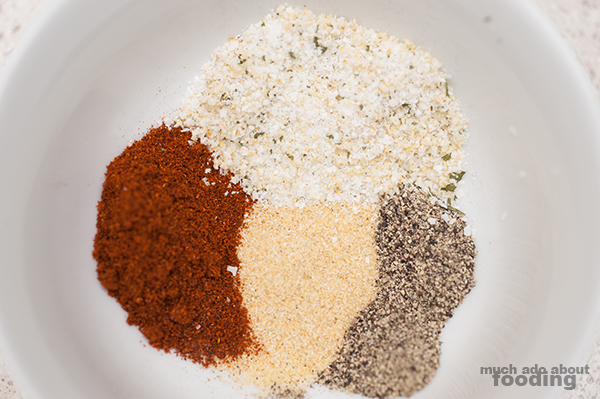 First things first though - mix together your garlic salt, onion powder, pepper, and paprika. 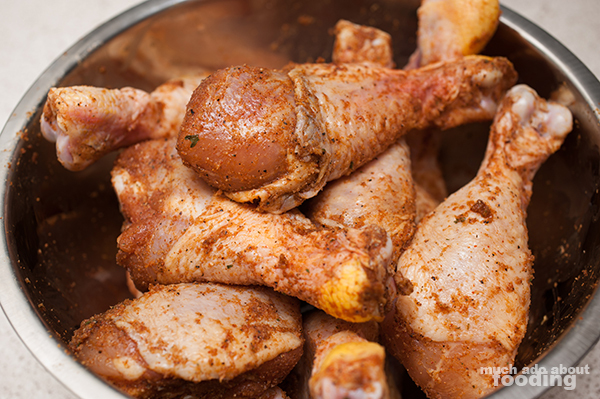 This will be your rub for the chicken. You can either mix it all together in a freezer bag for less of a mess or in a mixing bowl. 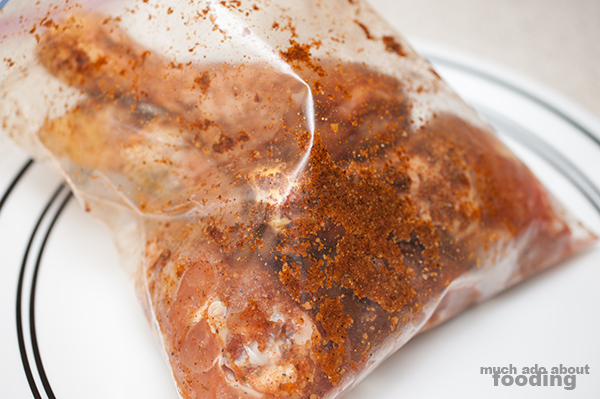 The minimum time to let it marinate in the refrigerator is 20 minutes but if you have more time, leave it for a few hours. If you are doing the 20 minute time frame, you can then also pour milk and vinegar into another bowl and let sit for 20 minutes so you remove both at the same time. Either way, you'll need the milk to sit with the vinegar a while. In a shallow pan, pour oatmeal. Preheat oven to 375°F. 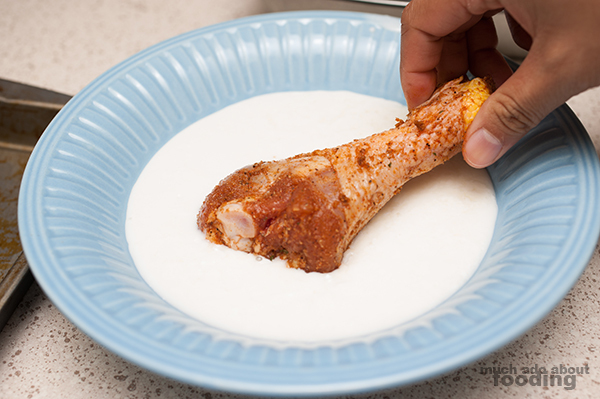 Stir milk mixture and then dip drumsticks into it to fully cover. 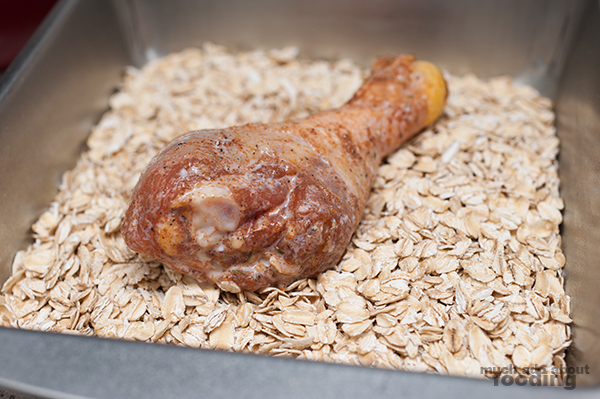 Then transfer drumstick to oatmeal and coat completely. Place on a baking sheet. Repeat for all drumsticks. In a separate bowl, melt butter. 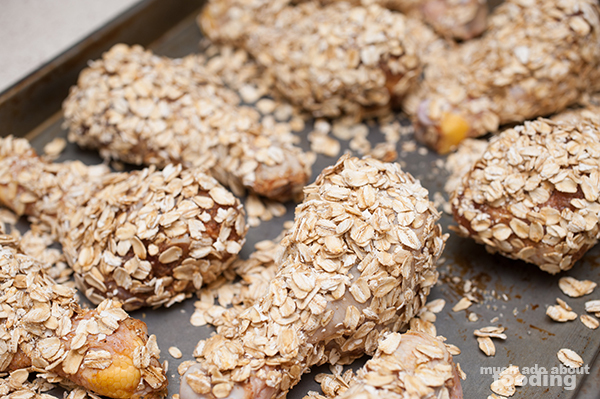 Drizzle melted butter over each piece of chicken to "lock in" oats to the skin. Bake in oven for 40-50 minutes until browned. Remove and enjoy! The original recipe suggested maple gravy with it. 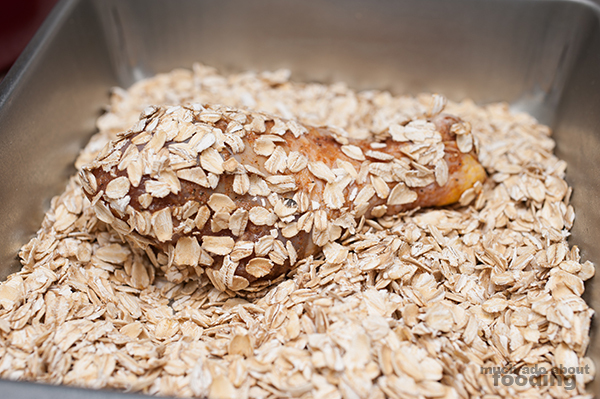 I thought it was perfectly fine on its own considering how crunchy the oatmeal made the outside. Challenge accepted! 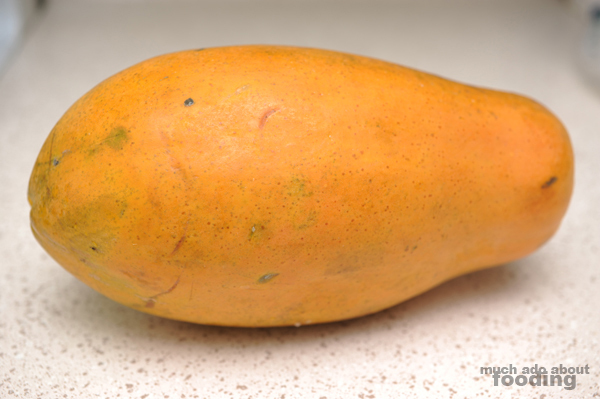 Let's see how I can cook with ripe papaya instead of the green kind typically used. I bought this tropical papaya from the supermarket across the street from Duc's place because they always have amazing sales. This time, two pounds of papaya goodness for under a dollar. How awesome is that? Anyhow, comment later today on the picture on Facebook! I'm so trying this recipe =) Pics to follow!